Rita Sahatçiu Ora, born in Pristina, is a singer and actress who grew up in London and lives in the UK. Rita appeared with Craig David in his 2007 hit “Awkward” as well as in his 2008 hit “Where’s Your Love” featuring Tinchy Stryder. 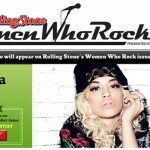 Rita Ora was spotted and signed up by Jay-Z’s label Roc Nation. While recording her debut album she got guidance from Jay-Z and feedback from Beyoncé. She has had two No. 1 Singles in the UK Charts in 2012. The first song, “Hot Right Now”, was in collaboration with DJ Fresh; the second was “R.I.P” with Tinie Tempah. Recently, Rita released her single “How We Do (Party)” in the United States, performing live for the first time in the TV show “Good Morning America”. Her first album, called “Ora”, is expected to be releasee in September 2012, and currently she is opening for the Coldplay stadium tour across the world. Since its release in December 2011, Rita’s song “Hot Right Now” has had more than 26 million viewers in YouTube.